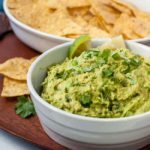 A quick and easy recipe for authentic Mexican chunky guacamole with variations to take it up a notch! 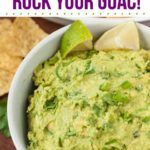 Here’s a recipe for authentic Mexican chunky guacamole that takes only 5 minutes and 3 utensils! Do you have dishes you make all the time for which you don’t need a recipe? Some dishes just become second nature to us, and we never have to consult a cookbook. We add, and stir, and taste, and correct it with a little of this or a bit of that until it’s just right. 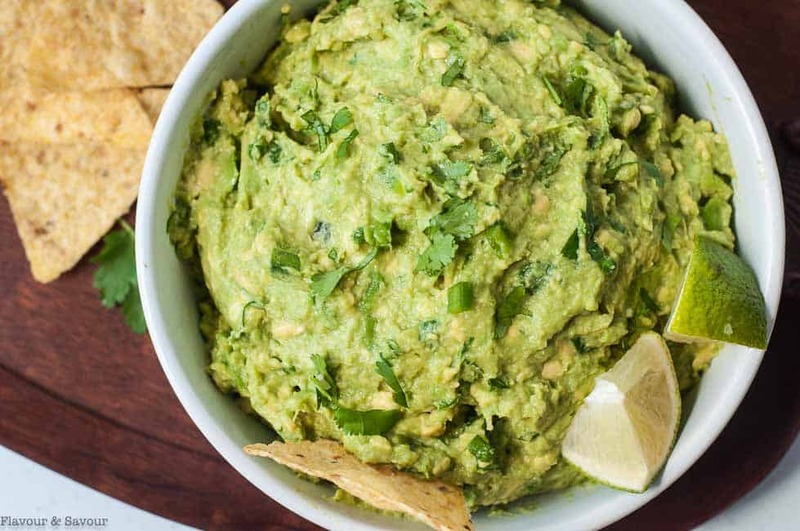 Guacamole is one of those dishes for which I never use a recipe, but I was asked to put one here on the blog, so here’s my recipe for traditional Quick Chunky Guacamole! Start with this classic recipe, then experiment with some of the 8 variations I’ve listed below. avocados: You’ll need 2. They should be fully ripe, but still a little firm. lime: one, just for the juice. Fresh squeezed juice is always best! onion: you only need 1/4 cup, so a small one will do. cherry tomatoes: 6, cut in half. These are optional. I make it both ways, with or without tomatoes! 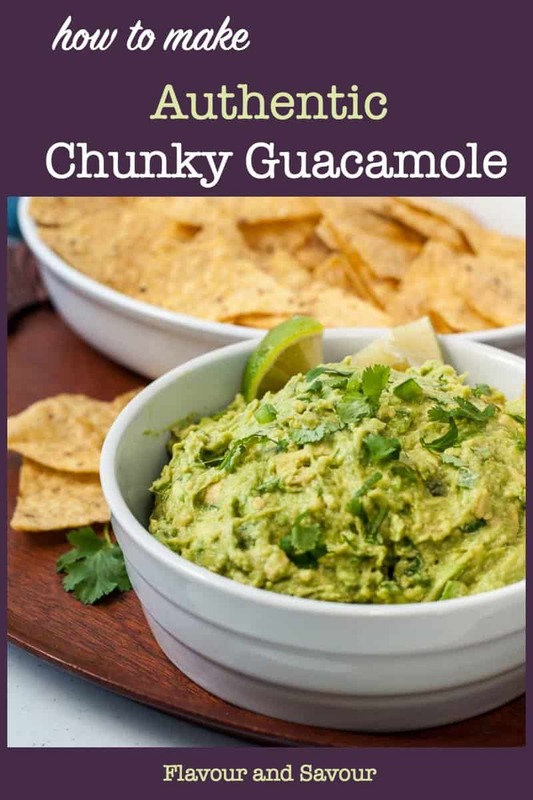 How to make Authentic Chunky Guacamole that everyone likes! 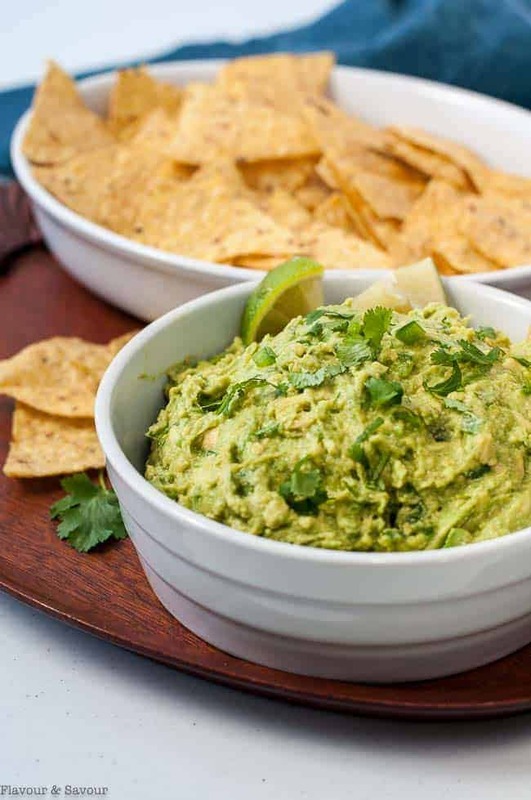 Guacamole is very simple to make and needs no special equipment other than a knife, a fork, a bowl and some hungry, appreciative family members or guests. Slice the avocados, remove and discard the pit. Then use a paring knife to slice the fruit lengthwise and then crosswise. Scoop out the flesh and mash with a fork until chunky. Add the lime juice and toss to prevent browning, then fold in the remaining ingredients. Taste as you go! Correct the seasoning by adding a little more lime juice or salt, or even an extra clove of garlic. Remember that the flavours will become stronger as its sits, so don’t go overboard. Let the guacamole sit (tightly covered) for an hour at room temperature to allow the flavours to blend. Pressing a piece of plastic wrap on top will keep out the air which causes the avocado to turn brown. 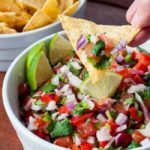 Serve with tortilla chips and pico de gallo, or with nachos, tacos, or as a dip for fresh vegetables. 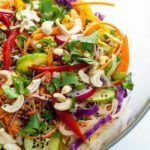 Super simple to make, and easy to clean up afterwards! Now let’s have some fun with this basic recipe and kick it up a notch! Here are a few of our favourite add-ins. mango-pomegranate guacamole: add 1/2 a mango, finely diced and a small handful of pomegranate arils. 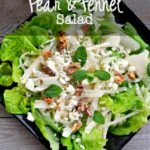 A sweet and salty flavour combo! 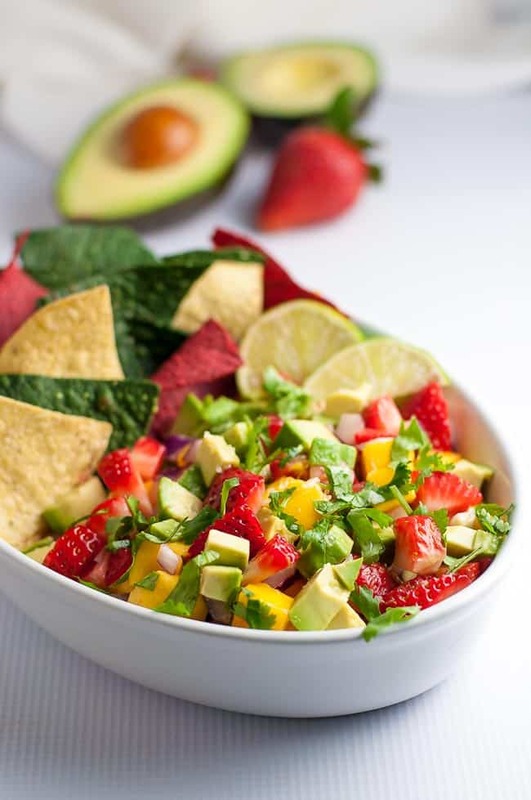 strawberry-mango guacamole: cut fresh strawberries and mango into small cubes, mash one of the avocados and cut the other into small cubes to make a chunkier guac. Ready to Guac and Roll? Here’s what to serve it with! 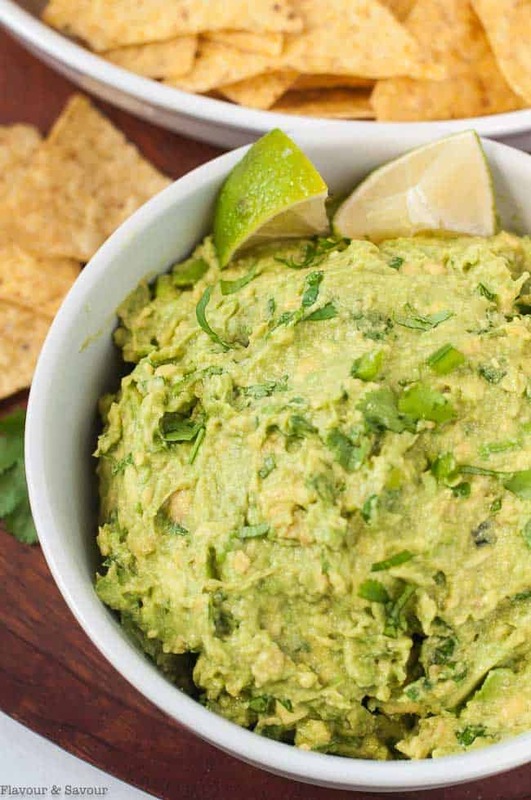 This recipe for chunky guacamole takes only 5 minutes to make. Serve with tortilla chips, as a dip for fresh vegetables, as a sandwich spread or with tacos. Slice avocados in half, scoop out the flesh and remove and discard the pit. Place in a medium bowl, mash with a fork and toss with lime juice. Stir in the remaining ingredients, leaving it as chunky or as smooth as you like. Sprinkle with a little coarse salt or add a bit more lime juice if needed. Cover tightly and let sit at room temperature to allow flavours to blend before serving. Pressing plastic wrap firmly on top of the guacamole will help to prevent it from browning. 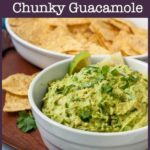 I love all your ideas for add-ins to basic guacamole. I made it with bacon and jalapeño and it was incredible! That’s one of my favourite combinations, too! Always a hit.